Sanders is right, of course, about not going down that road, but down that road, again? Who’s to say the the U.S. is not already interfering, there? I doubt even Congress or the White House knows to what extent the CIA has been active in Venezuela and what role the U.S. has played to create the current unrest, there. Not that any of us will ever know, of course. The Empire is ever cautious about airing its dirty laundry. If Bernie Sanders had not been betrayed by a complicit and corrupt DINO Party establishment, think where we might be today…who Bernie might have appointed to leadership positions and roles, and how the world would look today, rather than under the odious malignant and ignorant mental case figurehead of the criminally destructive and corrupt trump regime! The same entrenched forces, serving wealth and corporate campaign bribery for the quid pro quo policy decisions they pay for, are still resisting, undermining and subverting progressive values, issues and agenda, and progressive newly-elected people’s representatives…the DINO servants of wealth and the status quo of highly questionable integrity, morality, and servitude to those forces that bribe them are highly malleable…it is only a complicit political strategy they stand their ground at all on any critical issues the people demand of them! Their silence and/or waffling timidity on such issues and their diversions tell their story! While it’s of course important that Sanders makes anti intervention comment there is no need to condem Maduro. Just keeping anti communism alive and well! It was a very disappointing statement from Bernie, no mention of the causes or of C.I.A. election meddling . I just can imagine the people pouring out of Venezuela right now, with the reported street demonstrations and looting. So, um, where will they go? Not to Brazil. Is Mexico ready for this? After careful consideration, and after consultation with my family, I wanted to announce here, on Commondreams.org, that I am now a Florida senator and will take Marco Rubio’s place. I have called his office to inform him of my decision, and asked that his constituents call me directly on all senatorial matters. I have also informed him that he no longer has the power to work in his office in DC or to even call himself a senator. I tried really hard to freeze his assets and to cut his district off economically from the outside world, but I am just one person, and I failed at that. Sorry. This will have to do for now. See, we all argue every day about should we take over the Democratic Party, should we work to form a third party, all a waste of time. Little did we know that we could declare ourselves president, a senator, mayor, or even president. Screw organizing and trying to win elections, let’s just appoint Chomsky to be president, and let him form a new government. Trump’s gone folks, it’s over. Let’s also look around local DSA chapters and see who we want to take the place of Hoyer, Pelosi and Schumer too. Anyone want to be governor of Georgia? Lots of really sketchy things went on in that election. The president of France, 17% approval rating and facing unrest, supports what is going on in Venezuela. So, I take it, if no one in the Yellow Vests declares themselves president, maybe someone here can step up. Who wants to be president of France? All kidding aside, I called dibs on Florida’s senate seat. You can be president of France or governor of Georgia, back off my senate seat. I will NOT be governor of Maine, too cold there. We have been intervening directly since the Dubya failed coup attempt to overthrow Chavez. And more recently with brutal sanctions. Oh, they can go to the country that has gotten over 10 billion from us since 2000. Among the deadliest places in the world for journalists, has among the most internally displaced people in the world, a place where indigenous groups are dealing now with land grabs that is amounting to cultural genocide, deadliest place for union organizers, a country that is largely controlled by death squads, a country where thousands of politicians, organizers and activists have been killed since the 1980’s. A country where over 80 Catholic priests have been killed since the mid 1980s because they were trying to defend the poor. A country not only controlled by paramilitaries, but also drug lords and corrupt politicians. The recent right wing president (Uribe) of this country was named by the DEA as one of the worst drug offending politicians in the early 1990s in his country. Evidence came out that paramilitaries actually met on his ranch to plan hits and his campaign manager was arrested for smuggling cocaine. Colombia, a great democracy, and Venezuela’s neighbor. We haven’t done to Colombia what we have done to Venezuela, can you image how much worse it would be if we did? No, we have given it massive amounts of aid, and our CIA essentially created its paramilitary system as a means of fighting back against social movements. They’re helping us in Venezuela, and in no way does what we have done in Colombia or places like Central America make our rhetoric about human rights and democracy look absurd. 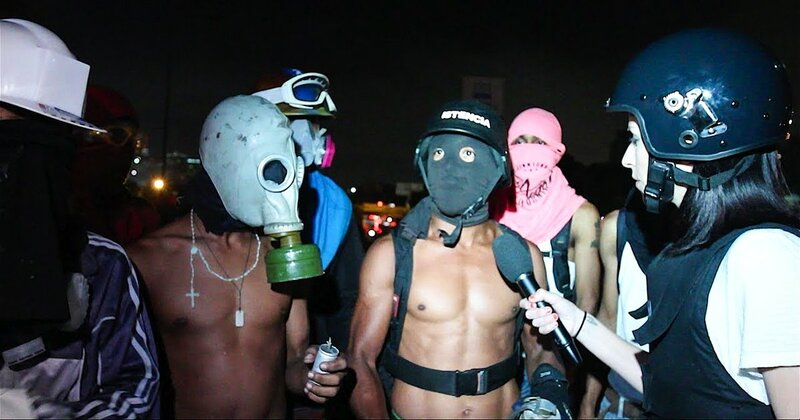 Abby Martin of the Empire Files did a pretty impressive investigatory piece on Venezuela and the real cause of the unrest there. My thoughts exactly. I thought there were sanctions and embargoes against Venezuela which has furthered the starvation of the people which has been assisted by the wealthy elites in the country. So there is no actual proof that we are working with the wealthy elites to overthrow the socialists during the last 19 years? Yes, I seen her work and makes you wonder what to believe, however, I know the US gov’t has had it hand in all of it. The resources of this nation is the goal of the multi nationals that our government serves. But like I said in my last post, corruption trickles down meaning they know what is going on so get mine while I can?? I’ll second your appointment to be the Senator from the proud state of Florida. Thanks. You are now my chief of staff. Congrats! See how this new “democracy” works? Let’s call it the Rubio Doctrine. The news out of France is rich , and as usual rife with hypocrisy. Macron has claimed Maduro as an illegitimate leader of Venezuela. He claims Maduro using violence against protestors and calls for even more sanctions. Meanwhile In France the yellow vests are being tear gassed and beaten as they protest a government with popular support far lower than Maduro. I hereby recognize Didier Guillame as Frances legitimate leader. Bernie Sanders is simply parroting imperialist views. There is no way to know what society in Venezuela would be like without bipartisan US destabilization and attempted coups. Democrats have undermined democracy in Venezuela in partnership with republicans and Bernie has worked with democrats through it all. He is a senior member of an imperialist war government. May I ask you Bernie: WHY NO MENTION OF ELECTION MEDDLING IN THE 2016 DEMOCRATIC CONVENTION? Bernie, why oh why did you say: “we have to back Hillary, because we cannot allow Trump to become POTUS”! Thanks Joan. Looks like I’m coming out of retirement after 13 years. Careful, Florida has a lot of swamp critters already.